At first, stone's surface should be flattened. Before sharpening , stones should be soaked in water. You should exert pressure on the forward stroke and release pressure on the down stroke. Prepare a medium stone about #1000 . First sharpen the front side. Hold the knife at the angle of approximately 10-12 degrees against the stone (about the thickness of two or three yen coins). 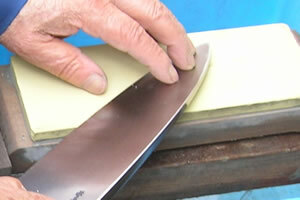 Sharpen from the tip(Kissaki) until you feel a slight burr along the edge. 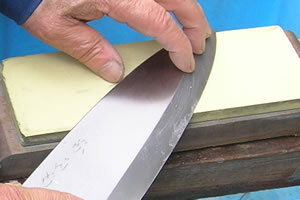 After the tip, sharpen from the middle of blade to "Hamoto" until you feel a slight burr along the edge. Next sharpen the reverse side. 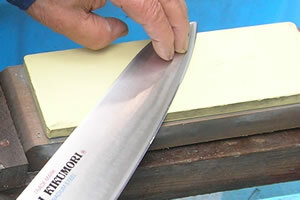 Hold the knife at the angle of approximately 5-10 degrees against the stone (about the thickness of a yen coin). 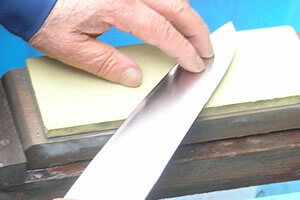 Sharpen until you feel a slight burr along the edge. Repeat a few times about the process 2.-5. Finally sharpen to obtuse angle, so you can remove a slight burr. That's over. 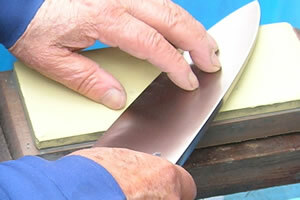 If you re-sharpen by fine stone about the process 2.-6., you can take more excellent sharpness and mirror-finish face. First sharpen the front side. "Kireha"of blade and stone should touch well. Be carefull not to break the "Shinogi"line. Next sharpen the reverse side. Lay the Knife on the stone, and sharpen until you feel a slight burr along the edge. Prepare a fine stone about #8000 . You re-sharpen by fine stone about the process 2.-6., you can take more excellent sharpness and mirror-finish face.